Daru McAleece is a Druid storyteller, performer and visual artist with a strong love of Nature, science-fiction and Celtic mythology. Although he was born and raised in Edinburgh, Daru has strong ancestral links with the Scottish Borders where he now lives. 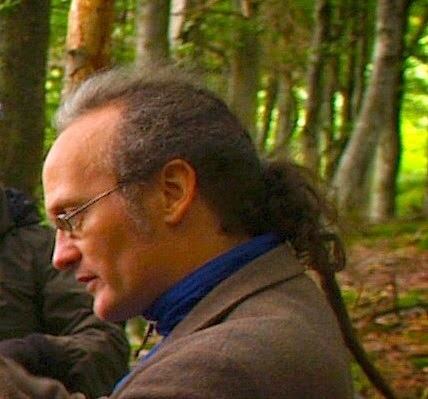 He currently works as a Forest Schools practitioner and is the founder of the Bardic Grove storytelling project. • Who or what called you to storytelling? My background is as an artist and designer, and my interest in storytelling began when my love of my love of narrative and image fused together in graphic novels by artists and writers such as Bill Sienkiewicz, Alan Moore, Dave McKean, Steve Bissette and Neil Gaiman. I actually got drawn towards becoming a storyteller through discovering the path of Druidry. This began with me going out to explore and learn more about my local landscape, especially learning more about the kind of trees present there. This experience culminated in my attending a Druid camp where I found a very supportive community, and took the leap to perform my first story in an evening session in a yurt, and was so inspired by the experience I have been telling stories ever since. • What was the last story you performed or told? The last story I told was based on a personal story in my life. Recently my partner's mother Maureen passed away and I was asked to share her story and celebration of her life by the family at her service. Out of this I recently performed the story of experiencing her passing and the road trip into Wales, the amazing (and even at times funny) journey of her family and meeting the West Wales community, characters and landscape as we created her service. The story woven also touched on memory, stories we tell and the nature of storytelling itself, and is one of my deepest experiences of creating a performed tale out of personal experience. • Who's your favourite storyteller? I am going to go non-traditional here and say Eddie Izzard. I find his butterfly mind quite wonderful and magical, as well as adoring his use of voice and characterisation. I saw him way, way back before he was a stand-up during the Edinburgh Fringe Festival as a street performer - where I remember him in the middle of a slightly odd (and failing) escapology act where he threatened to cut the head off a teddy. Something about his style of verbal delivery hit the right note for me though and it was great to see him then make the leap to stage stand-up. Actually I don't see him as a comic at all, but someone who weaves together massive, rambling stories out of the odd and bizarre, pop culture, history, film the small moments of life - all peppered with sharp observation, albeit from a different angle. Listen to my conversation with Daru, starting on Sunday 18th May at 7am EST (Canada/US) / 12noon BST (UK/Ireland) and again on Tuesday 20th May at 8pm EST (Canada/US) / 1am BST (UK/Ireland) and Thursday 4pm EST (Canada/US) / 9pm BST (Canada/US). Blues and Roots Radio for the best in story and music from the independent artist.